Treat yourself with a reproduction on canvas in real size in limited edition or with a reproduction on paper and thus participate to keep alive the work of Alfred Courmes ! 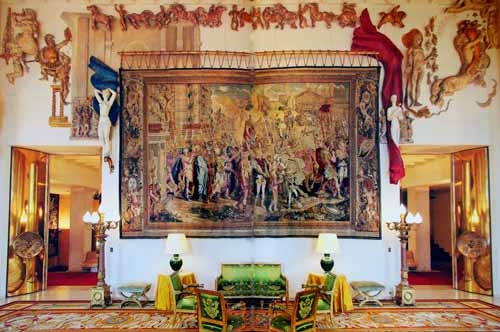 They were five: five artists who participated to the decoration of the Embassy of France in Ottawa. Three of them came to work on the spot while two others realized their works in France and send them to Canada. These artist are Alfred Courmes of course, Louis Leygue, Charles-Emile Pinson, Robert Cami and André Bizette-Lindet. 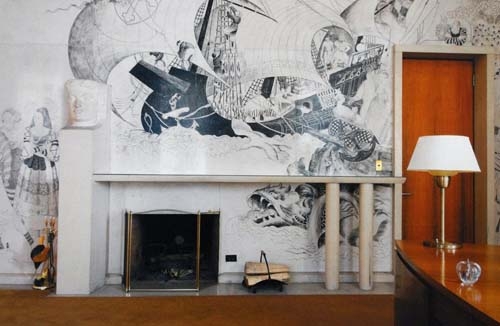 Courmes, Leygue and Pinson, arrived on the spot, were asked to decorate a space. Courmes was to decorate the main dining room, Leygue the main lounge, and Pinson he office of the ambassador. 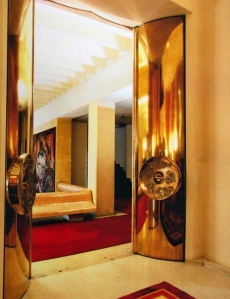 Cami decorated with four round medaillons the doors made by Jean Prouvé. 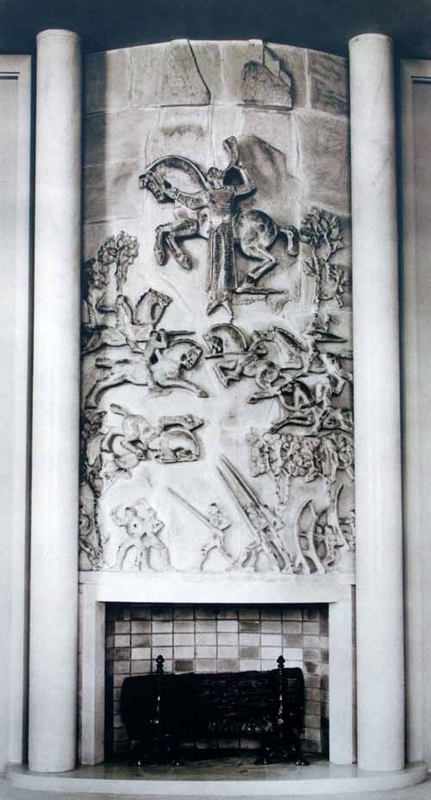 Finally, Bizette-Lindet sculptured bas-reliefs for the decoration of the round lounge. He studied sculpture in Paris. Ranked first at the examination of the school Germain Pilon (applied decorative arts) and also at the entrance examination of Decorative Arts. He continues at the school of Fine Arts. 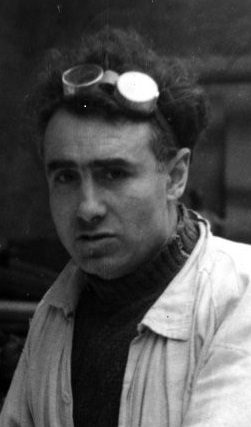 He competes for the prize of Rome in 1931, obtains the first Grand Prix and stays at the Villa Médicis in 1932. 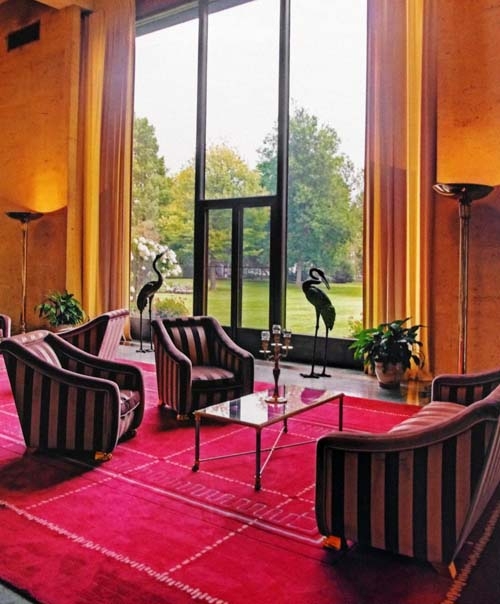 He meets Eugène Baudoin, the architect of the Embassy of France in Ottawa in 1935 and is entrusted with the decoration of the main lounge. 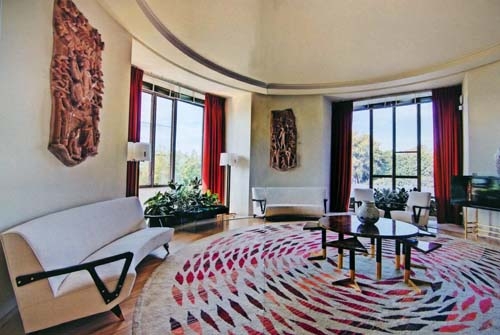 “Eugène Baudoin did not wish to design a lounge and then see it decorated. Quite the opposite, from the beginning of his project, he wanted to build around the decoration. 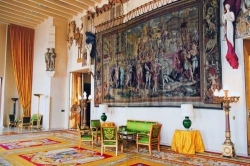 A prestigious tapestry caugh his attention: “the triumph of Constantin” weaved in the XVIIIth century, according to Raphael’s design at the royal factory of Gobelins”. 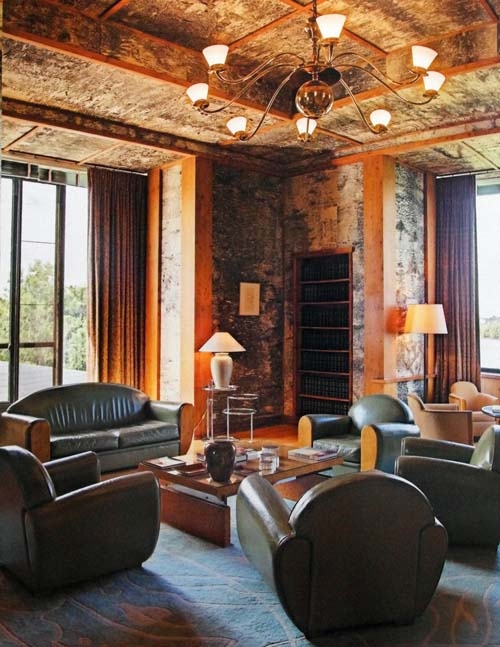 Furthermore, Baudoin –pioneer of the use of concrete in construction – decided to use concrete, raw and not even surfaced, as a decorative element for the ceiling of the lounge. 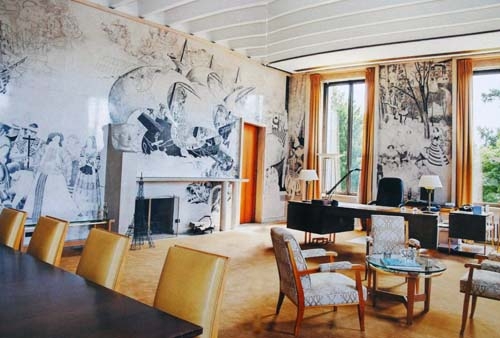 Louis Leygue was thus in charge of reconciling these two paradoxical options: “the invaluable tapestry and the reinforced concrete” The artist will be inspired directly by yhe tapestry and its borders to create a decoration in polychromatic stuccos which will emphasize these borders on the totality of the main wall, and link them to the raw ceiling.” Jean-Paul Ledeur, the Thirties on the banks of Outaouais, 1993. Leygue wil represent among other subjects: Adam and Eve, the Profane Love, the sacred Love and the Peace. Louis Leygue also intervened more modestly in the office of the ambassador, his anteroom and its landing on the first floor. Benefiting at eighteen years old of a scholarship to learn in the engraving workshop of the famous school Estienne, he is accepted at the School of Fine Arts in 1925. First grand prize of line-engraving in Rome in 1932. For the anecdote, he will engrave bills for the bank of France and forged documents which will allow him to return in France after having been made war prisoner in 1942. Charles-Emile Pinson executed a stone carving of a unique kind in the office of the ambassador, on a surface of at least hundred square meters. He was finally able to realize his youth dreams and work this technique of miniaturist with scale and immoderation. 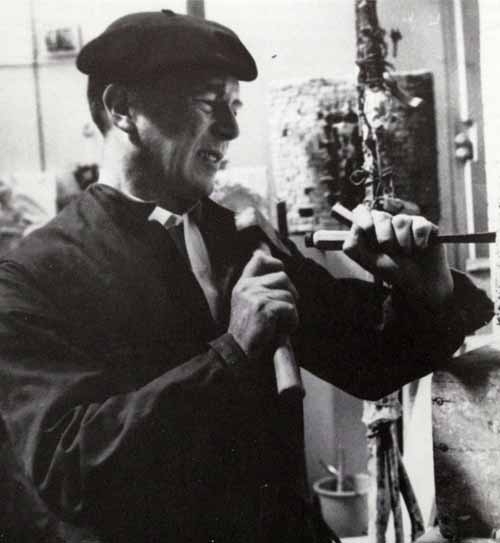 By sculpturing out of the frame, he brought his art at the level of painting. In 1938, he has all the stones laid up, then engrave directly on the wall and ink in black all the hollows. He tells the story of Canada: from Jacques Cartier to the treaty of Paris of 1763 giving Canada to Great Britain. The legend of the New France is exposed in tyen panels on four walls of the room and contains about 240 characters. 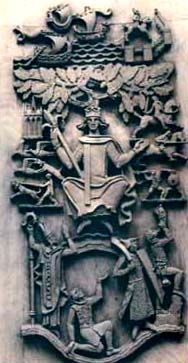 Office of the ambassador, “the big hermine”, stone carving 1938. 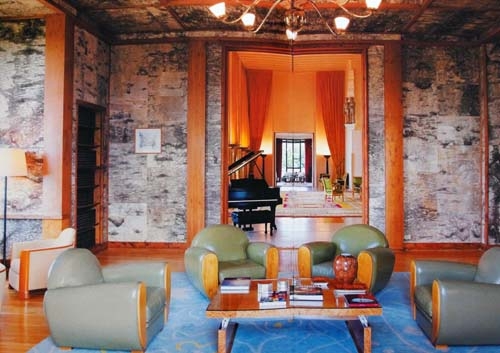 To the left of the fireplace, “France”, Louis Leygue. The stones polished in the Mansart style of the office of the ambassador, but also the marble used for the frames of the windows, baseboards and consoles of the dining room, stones of Saint Maximin, the travertine of Salamander type for the ground, and Burgundy carvings for the banister of the staircase of the main hall, the Suffren of the round lounge, the stones of Artiges of the fireplace in the smoking room, but also the doors, windows and copper frames of the windows, were sent from France. Draftsman and engraver, he begins studying at the Fine Arts school of Bordeaux, then in the national school of Fine Arts in Paris. First Grand Prix of Rome for medals engravings in 1928. 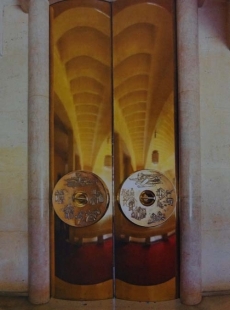 Eugène Baudoin asked Robert Cami to decorate two big double doors in the lounge of the embassy. 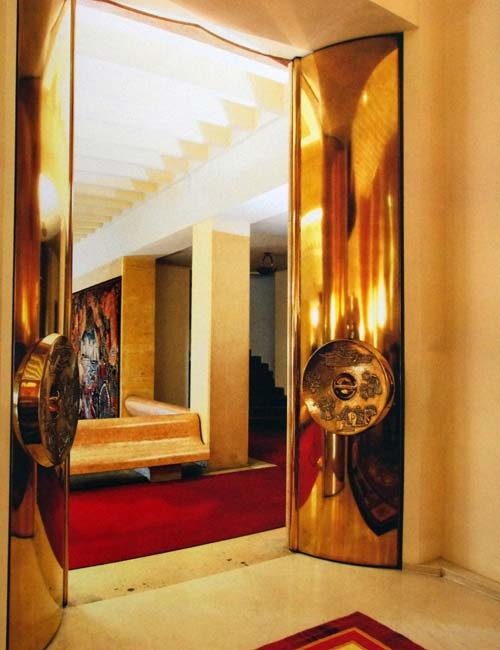 Created by Jean Prouvé, their convex and polished bronze reflects the ceiling vault, creating an unexpected prospect. 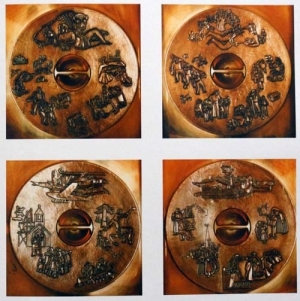 Cami will realize four engraved medallions as testimonies of values in relation with Canada : the Work, the Family, the Memory. 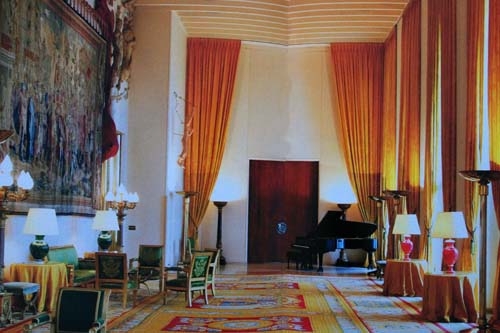 First Grand Prize of Rome for sculpture in 1930, he meets Baudoin at Villa Medicis who will entrust him the decoration of the round lounge which continues the main lounge of the embassy. 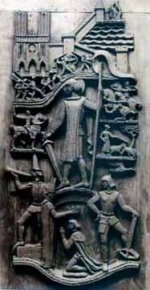 André Bizette-Lindet makes three panels of natural terra-cotta, ceramic way, on the themes of France history, through Saint-Louis, joan of Arc and Roland at the battle of Roncevaux. He also made among other things, the sculpture of the monumental doors of the Museum of Modern Art in the city of Paris. Two other places, the lounge of the birches (the “smoking room”) and the entrance hall where we can see two tapestries by Marcel Gromaire deposited by the National Furniture foundation in 1948 with two other on the theme of the four seasons. 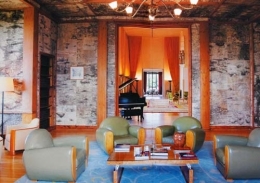 By imposing on these walls a program which has remained unique in the diplomatic architecture of the XXth century, Baudoin built an embassy most atypical at the time, full of strong symbolism. 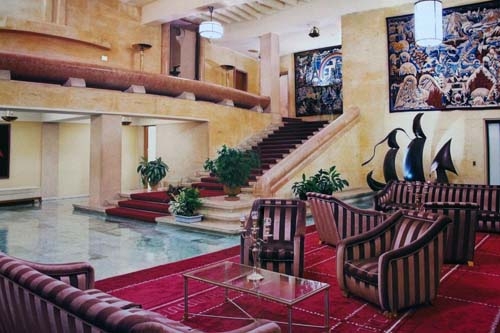 Masterpiece in architecture and decoration, it offers by its internal decoration, which has not been rightly perceived (this will be the subject of a next issue) all the examples of luxury and artistical richness that years passing by have confirmed. Jean Fouace, Ottawaa, French Embassy, 2010, international editions of heritage.